“I think, therefore I am” in Finnish. “Minä ajattelen, siis minä olen olemassa”, she answered. OK, that first sounded quite complicated, but after she explained it, it was completely logical and very easy to understand. A little later I took a one semester course at the Uppsala university, spread out over two semesters as evening courses. I learned the language more or less completely within that very short time. So, what are the characteristics of Finnish? It has a complete, full context free, orthogonal grammar. It has a bijective orthography, i.e. you can always pronounce correctly from reading and spell correctly from listening. Position independent clauses/sentences, due to each word bearing information. Due to the orthogonal grammar, there are further no obstacles to express whatever you want in an unambiguous way. However, English, which is now one of the main “global” languages on this planet, is a language that I’ll never learn, despite I’ve used it professionally for 30 years, and studied at young age in school between 10-18 years. So, what are the characteristics of English? Non-orthogonal semantic constructs. There are a lot of things that can not be expressed in the language easily, without very complicated constructs. Heavily position dependence of words within clauses. Even though sentences like “the car to I am going into”, “I am going into the car”, “going I am the car into”, “the car into, I am going” are all correct in a sense most people would consider these funny and may consider that you are joking. In e.g. Finnish all sentenses are correct and there is no real difference “autoon minä menen”, “minä menen autoon”, “menen autoon”, “autoon menen” are all formally correct and equivalent. English is good for poetry, puns and comedy, due to its many words and its tremendous ambiguity, but hardly for unambiguous communication. Finnish (as well as one form of Japanese in parallel) were also the first language with a successful implementation of a neural phonetic typewriter, by prof. Teuvo Kohonen, using a neural type of algorithm denoted self organizing feature maps. US Department of Defense (DARPA) has recently (I didn’t find the correct ref at the moment, coming within a few hours) made a study asking what type of languages the soldiers should learn in case of “invasion”. Well the question as such may be oxymoronic as the only recently known case was when Europeans invaded the continent and stole it from the native citizens. To make the soldiers obtain some defense, an immune system, they should learn a language encouraging logical thinking, like Finnish. On my facebook page, I list Galactic Basic Standard among the languages I am familiar with, which I consider Love, Logic and Math to be, but, who knows, maybe Tamil, which is a similar type of language like Finnish, with a context free grammar, which is the oldest language still in use in the same form, since 2500 years, is such a Galactic Basic Standard. I do not know Tamil myself, although I have a colleague who does. 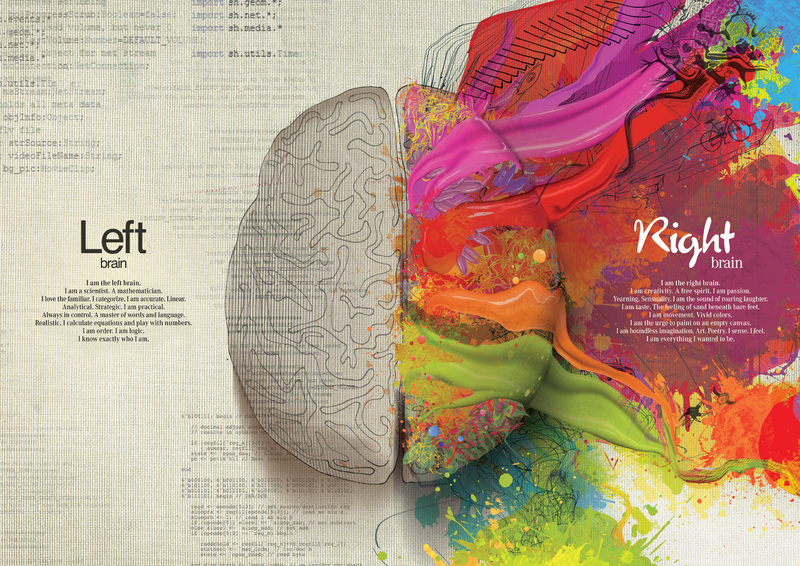 This picture I found on the web a few years ago, I do not know who has made it, I just consider it beautiful, despite this old “left”-“right” brain metaphor may be somewhat more romantic than accurate. Especially as I consider intelligence and logic to be equivalent with the ability/purpose to perceive, preserve and create beauty. PS. as a funny remark, did you know that the concept of Love, was invented by General Motors in early 90-ies as LOgic Validation by Emulation 🙂 , which is what I consider equivalent to Thinking. PPS. here I made a somewhat more elaborate comparison between Finnish and a few other languages on reddit a few days ago. These are some thoughts about what I consider the biggest frauds in human history. However, it was just recently I realized, that people may not immediately realize that this results in an extremely powerful exponential development, much more powerful than e.g. Moore’s law (but can explain it), but is probably also the simplest possible way to explain Rose’s law for quantum computation, and our brain’s ability to solve extremely hard computational problems very quick utilizing interactive recurrent neural networks having SuperTuring capability, using very slow processing elements (ms range…). This is basically the message what the Pirates and Free Software Foundation are trying to convey, where the success of the latter is quite obvious, as GNU/Linux developed according this concept now runs on (my coarse estimate) 80-90% of the planet’s computational resources, and if we only count Super Computers it is as much as 95%. And the most capable smart phones so far (my opinion, apart from the stupid stupid thing with builtin battery…) Nokia N9 and Nokia N950(the latter if you prefer keyboard as well) with MeeGo (like Android but with full GNU/Linux capability) apart from not also natively support hand writing and drawing, which is of uttermost importance for any personal intelligence enhancing tool. However, why the above principle gives rise to an amazingly quick evolution is probably a secret only completely understood by those used to cooking, as cooking is an art based upon sharing recipies which eons ago reached a plateau, thus perfection, where personal variations may be tried over and over ad infinitum, without ever boring people. Of course, for any kind of evolution to work, it is of course of uttermost importance that ideas (recipies, source code or drawings) are not locked in any way. They have to be shared freely, so any improvement made by any one entity can immedieately be cultivated by all other entities . The idea with money is that they should implement a motivational energy transport container, as an abstract, easier to exchange peer to peer instead of e.g. gold. But nowaday’s monetary system with fractional completely fictive value is instead forcing people into a malevolent attractor which is holding developing back. And… of course, both the patent system and the copyright system are such banks robbing the humanity upon the shareability of both culture, recipes and ideas, which causes the whole planet to be held in a status quo, a complete stand still. Of course, there are usually two sides of a coin, and one has always to assert both thesis and anti-thesis, to reach a balance. The patent system was once also invented with the good intention to promote redistribution of ideas, that is, each inventor got a short monopoly of an idea, in exchange for public documentation that could, with some delay, be shared to benefit the humanity’s development progress. The copyright system was originally invented with a similar good intention, to redistribute culture and information, giving a short privilege to the creator, but also having the good effect that the information became freely sharable for the benefit of humanity. Now as we have seen how commercial copyright have developed insane extensions and completely immoral and annoying inventions like DRM and DMCA it is clear that is now a pure obstacle. However, as very important sources of information, like Wikipedia, the most valueable information resource on the planet, whose information is shared according Creative Commons, and the copy left type of software and documentation licences like General Public License, which are based upon the copyright law, the copyright law thus also guarantees that information is shared in an optimal way. Now regarding ideas, there is a problem, to redistribute wealth in ideas and designs it actually needs some kind of banks, where ideas can be focused, stored and redistributed. As all of you used with social networks, like facebook, google+ and many others, the sharing of ideas there often constitutes a kind of noise, where it is very hard to get any kind of focus at all. The project I’m working on, planned since 1987, so far with white paper in Swedish only, in this report TankeNyckeln from 1987, is patent applied in US 2004, trade marked in EU and USA as Wish-IT®, Wish Innovation Technologies® and builds upon the research I did from early 90-ies to 2008 in collaboration with Royal Institute of Technology and World Health Organization. Publications available from this our company page and this page. This project will soon present a portal, which will be an intermediate idea magnifier and idea storage capacitor where ideas and designs will be focused and redistributed for an efficient and fast technological evolution. All product designs which are focused with the help of the artificial intelligent idea clustering methods will be redistributed utilizing a copy-left licence. The drafted principle suitable for an arbitrarily advanced technology is so far drafted as Generic Pitchfork Licence. Now, as the development will be Ordo(7000000000^t) which is an ordinary exponential function, although with a tremendously fast growth, this is of course not all. To this we also have to add other effects, like Moore’s law, which also follows an exponential development. What this will arrive at is an iterated exponentiation, or hyperexponential, which constitutes a pure mathematical singularity. OK, now I need to do some other stuff I promised to do today. PS. the method is made unpatentable in the rest of the world, through PCT 2005.